"ELGAMA-ELEKTRONIKA" Ltd. signed an agreement recently with AB „Energijos skirstymo operatorius“ (ESO, energy distribution operator covering Lithuania) based on supply of smart electricity meters with GSM modems. As many other utilities based in different countries, ESO implements smart metering projects that create an added value for end users in regard of both, their time as well as money saving possibilities. Taking into account the advantages of automated data collection system users no longer need to declare electricity consumption data themselves. Moreover, possibility to monitor instantaneous and historical electricity consumption leads to an opportunity to adjust daily consumption habits and increase efficiency in energy usage. Agreement of electricity meter supply with TAURON DYSTRIBUCJA S.A.
Efforts of „ELGAMA-ELEKTRONIKA“ Ltd. to strengthen its position in neighboring Polish market ant to increase export results were successfully evaluated by tangible results – together with partner Systemy Pomiarowe Elgama an agreement of electricity meters supply was signed with TAURON Dystrubucja S.A. (electricity distribution operator in the southern region) at the beginning of this year which amounts to 2 mln euros. The key Polish electricity distribution operators comprise 16,6 mln metering points. Recently they perform numerous pilot projects as well as a rapid implementation of smart metering solutions, however, remain highly demanding towards the suppliers of devices and systems. Taking into account consistent efforts of our team and implementation of specific and strict requirements into measurement devices developed and manufactured at company, the fore-mentioned agreement is a double achievement – as sales data increase as well as strengthening of company potential. "ELGAMA-ELEKTRONIKA" Ltd. signed an agreement with AB ESO (Lithuanian energy distribution network operator) for the supply of electricity meters in the amount exceeding 5 mln euros. 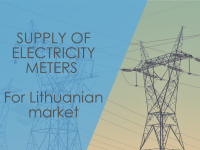 Company production that complies with all qualification and technical requirements was assessed as the best choice in the international tender and more than 350 K electricity meters are to be installed within the territory of Lithuania.